This is timely for those of us in the Northern Hemisphere – spring is slowly making her way back and many of us are feeling energized by the sunshine and early growth. 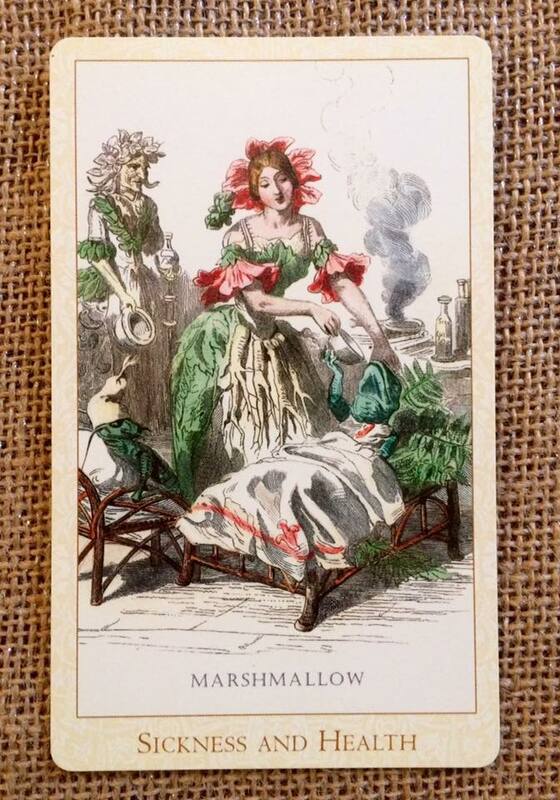 This card suggests we look to grow and tend to our relationships, regardless of whether they are new or years old. Also take note that increased creativity or a rebirth of sorts may be what’s needed. 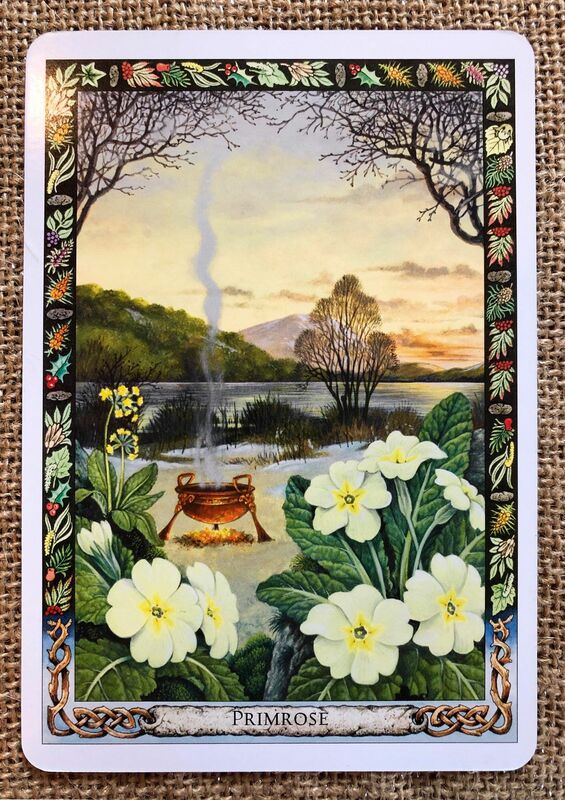 Meaning: Because they are so small and beautiful, and are among the first flowers to appear after winter, Primroses have always been associated with romantic love and new beginnings. Drawing this card may indicate that a new love is entering your life, or that a fresh wave of tenderness will appear in an existing partnership. Our relationships, like our dreams, have seasons, and however long you have been together it is still possible for a new cycle to being. Alternatively, this card may indicate not the dawn of romantic love but the rising of creativity within you. The Primrose is the flower of the Bard, and each of us has a Bard within us who longs to sing the song of their soul and tell the story of their heart. Out of the cauldron of Cerridwen came three drops, and the changes trough in Gwion Bach were profound and many. 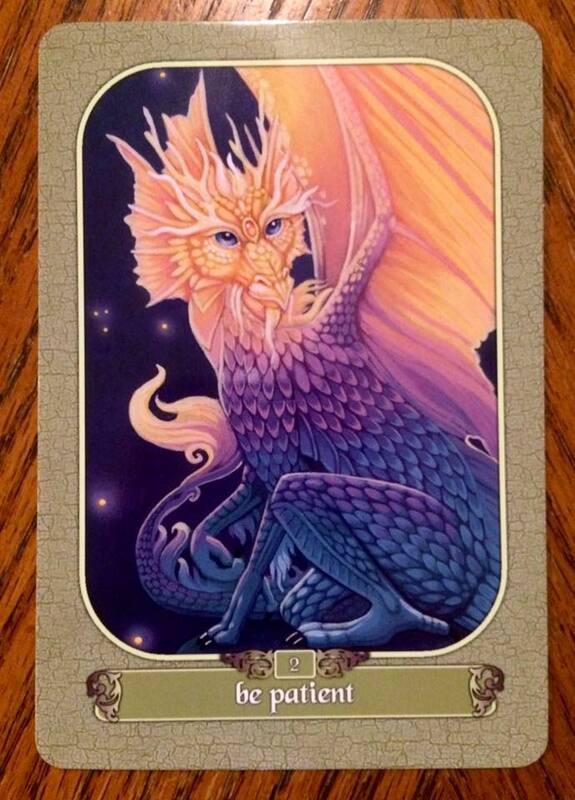 A third possibility is that, rather than love or creativity, thes card is pointing to a birthing of wisdom. On the flip side, this card could be reminding us that a search for love can easily turn into a trap that ensnares you in a world of illusion. Hollywood tries to ensure that none of us feels fulfilled unless we are in the throes of a passionate love affair, and yet experience, and now studies of brain chemistry, tells us that the initial stages of love give way either to disillusion and separation, or a less intense form of affection, care, and companionship that can lead to a fruitful and long-lasting relationship. 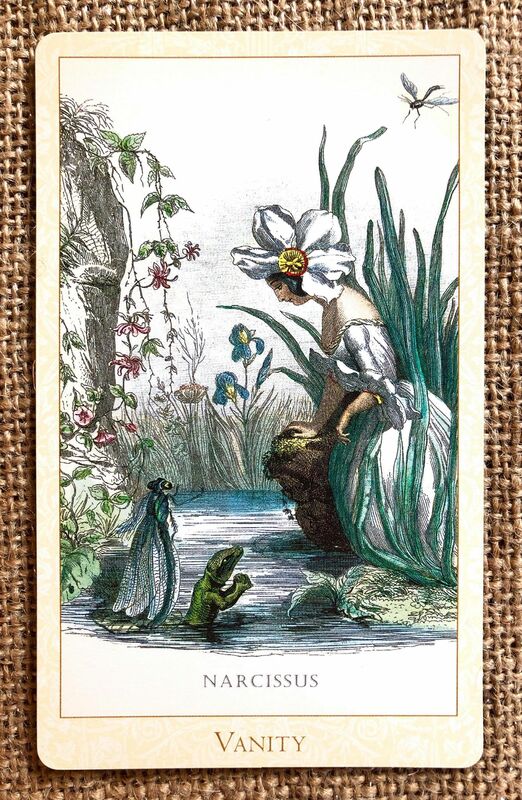 If you have chosen this card reversed, you may need to objectively assess whether you have fallen pretty to the illusory aspect of romantic love. To what degree is your quest in life to find completion through another human being, or through yourself? As yet another shooting is in the news (this time in New Zealand), I see this card and the deep need for everyone to speak their truth – but to learn to communicate it in a way to find common ground and not to continue to divide. A key phrase from the meaning is “it’s time to heal through communication.” Let us all being today. Meaning: Speak your truth. The soul loves the truth: communicate from your heart and share your reality without hesitation. Be willing to stand before the crowd and share from your Center. This isn’t the time to be shy and hesitant; it’s a time to heal through communication. You have the gift of a true leader through the way you communicate with others. Native Spirit Wisdom: During tribal Council meetings, a decorated stick, called A Talking Stick, would be passed around. As each council member held the stick, he or she held the opportunity to speak from the heart. Each person in attendance would be asked to carefully consider the words of each speaker. The Talking Stick reminded each person to be authentic. Communication restores trust and allows you to clarify your ideas, position, and feelings. It can be healing when you share what has been withheld. Now is the time to take a risk and have the courage to speak with clarity. Share any unspoken darkness that was heavy in the heart. There are times to hold back and be discerning, but this isn’t one of them. Even if you’re afraid, declare your truth for all to hear without fear of being rejected or misunderstood. When you do this, transformation and healing can occur. 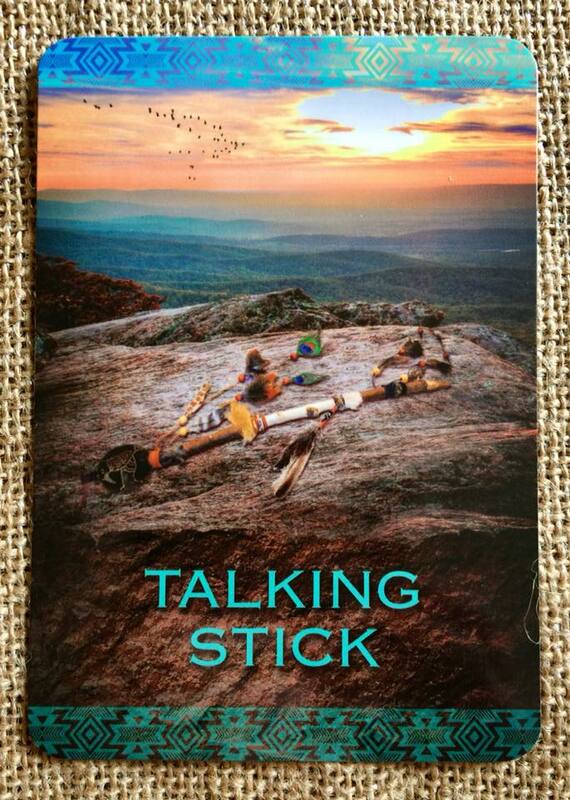 The Journey: Decorate a stick or a feather to use as your personal Talkingstick. Whenever you hold it, let it be a secret reminder to seek the truth with them. Take a minute every day to take stock of where you are and ask yourself about “what is so” in your life. Simply taking a moment to discover your inner truth can have a profound healing effect on your life. Today’s card is joined by Ten of Stones – Home, which speaks to the community that sustains and supports us, and by The Pole Star, which points to destiny, renewal, and the power and knowledge in the universe. 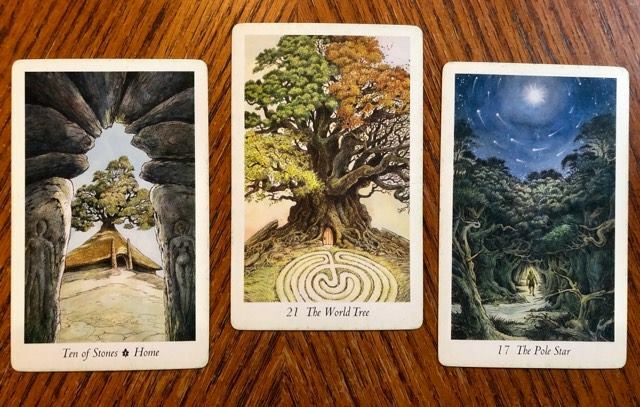 With the World Tree at the root of the spread (pardon that), this suggests an end of a journey or phase and the support either in your inner or outer community and plus the knowledge to move onto the next part. What does this spread say to you? MEANING: As a symbol of the conscious bridge between the living macrocosm and the inner universe of the human psyche, the world tree marks the end of one journey for the wanderer and the beginning of another. The wanderer began the journey around the wheel with an innocent and childlike curiosity, but the subtle growing process experienced on the way has brought inner gifts of wisdom and awareness. The final step is to follow the path through the living maze and enter the heart of the world tree to become one with the wholeness of the universal mind. Nothing is hidden and no misleading diversions are set to lead the unwary off the path, but to gain access to the tree one must walk the path and complete the journey. The unicursal labyrinth has no dead ends or false routes but leads on one wondering pathway from the entrance, inexorably to the center. Perhaps symbolizing the passage of the sun or guarding the souls of the dead ancestors and spirits in their place of repose, it remains a pathway to the core of the mysteries and and easily recognized image of the human journey. 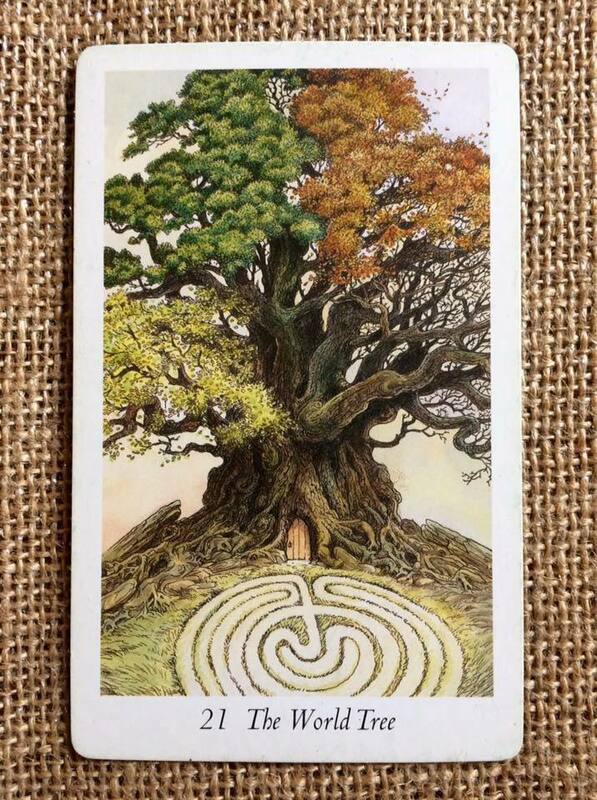 Though the doorway at the base of the tree is clearly visible and nothing stops the traveler from directly approaching it, walking the labyrinth in pathway is a ritual requiring patience and insight and enabling contemplation and meditation on the meaning of the journey. What may be found behind that the door is both individual and universal, for encompassed within the branches of the world tree or the four seasons of the cycle of life. Through the rest for healing of winter to the fertile freshness of spring, the power and joy of summer and the wisdom immaturity of autumn, the cosmic light of universal understanding shines from the heart of the tree, creating a bridge to the source of all conscienceless and life. The World Tree represents all individual life and all knowledge and one holographic field of consciousness and paradoxically, remains as one entity, a whole and complete. This complex concept is not Only stranger than we think; is stranger than we can think! DESCRIPTION: The great World Tree marks the end of the wander’s journey. All four seasons are represented in the branches of the tree and added space is a labyrinth of the kind of found in many parts of the world and dating back to prehistoric time. READING POINTS: The universe and all its blessings are available to everyone who seeks knowledge and wisdom with a sincere heart. On every level, the cosmos has a generous bounty and gives freely of its rich nourishment and fulfillment. No matter how long the journey of life may be, however many twists and turns the maze may offer us, in the end, if we persevere, we will reach the point of fulfillment. This may relate to material gain and wealth or two spiritual happiness and emotional security, but after the long process of learning, responsibility, and rebirth, it is now time to bathe in the light of renewal, attainment, and personal triumph. Breathe in the rich air, drink in the sweet water, and rejoice in the warming fire of the universal life force. Dedication is a big word for many of us, but it’s not something to fear. It’s dedication, not shackling. 🙂 What do you need to dedicate yourself too? MEANING: The spiritual warrior dedicates their arrows of inspiration by playing the bow as an instrument of summoning. The inner oath helps keep one on a balanced footing by dedicating skills to a great good. DESCRIPTION: A figure, clad in skin robes decorated with patterns of leaves, stands in a clearing amid the Wildwood. She is holding a bow as though it were an instrument, the back of the bow cradled in her arms and an arrow held against the string as if it were the bow on a fiddle. 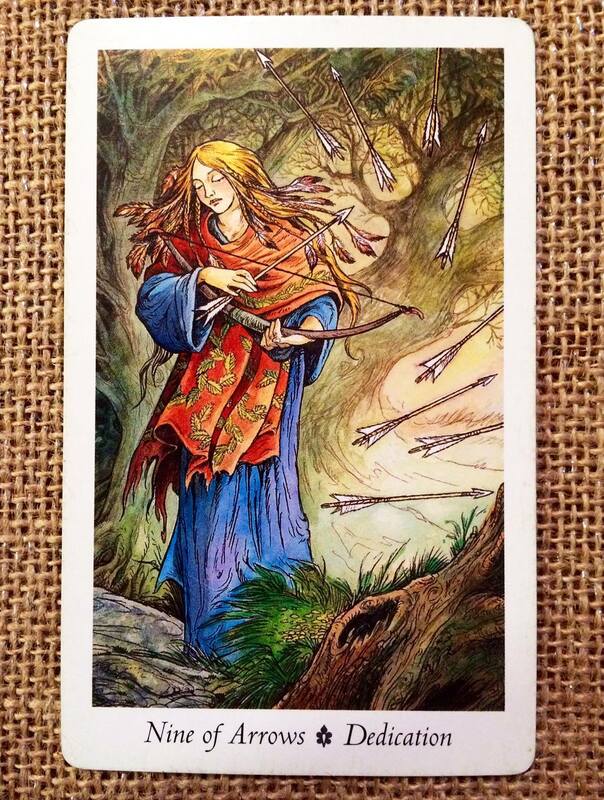 Around her, repulsed by an invisible shield, are another eight arrows. READING POINTS: To heed the calling to dedicate one’s life to any skill, spiritual path, belief system, or philosophy requires sincerity, self-discipline, and hard work. It is a sacred summoning that requires time and effort. For those who hear the calling and become spiritual warriors and protectors of the land, responsibility and sacrifice are also required. To deny that the human species has had a negative effect on the planet’s climate and atmosphere seems totally redundant. The growing awareness of our individual impact on the ecosystem may take on greater significance in the future. We cannot predict what effect our avarice and rapacious exploitation of the land will eventually produce, but the dedicated defender of the soil must protect the living legacy we leave for our children. To teach by example the value of respecting other’s beliefs and philosophies in honoring the land is immensely important. Sometimes a simply daily ritual reminds us of the oath we have taken to conserve and protect the environment. Dedicate yourself to the task of preserving the land and be a part of making the difference.